Now, for the very first time, researchers at La Jolla Institute for Immunology were able to directly probe germinal centers and shed light on the immunological processes by which a vaccine elicits a protective immune response. 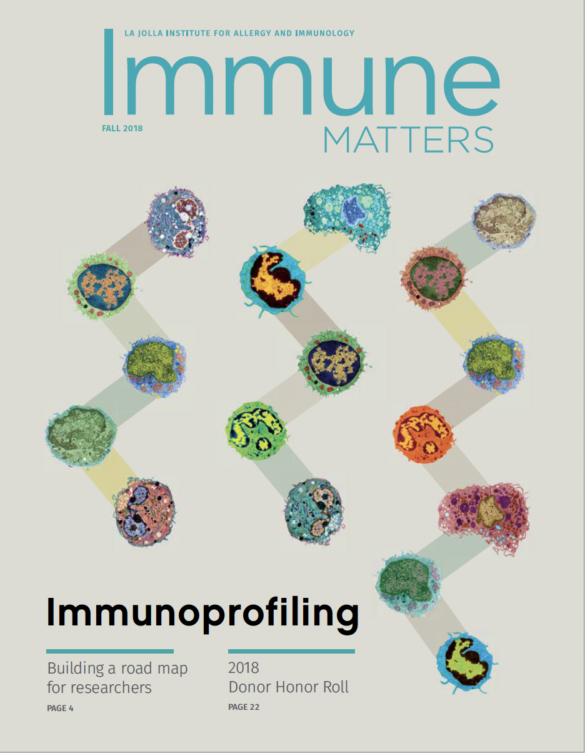 Their findings, published in the current issue of Cell Reports, revealed important immunological features and bottlenecks that determine whether immunization is successful and provide a valuable tool to track the potential of novel HIV vaccine candidates in upcoming human phase I clinical trials. More than two million people are infected with HIV every year. Although available treatment options can effectively stall the virus, only roughly half of HIV-infected individuals have access to antiviral drugs. Vaccines are the most effective means to prevent HIV infections and a preventive HIV vaccine would have a tremendous impact on global health. For any vaccine to be successful, it has to induce broadly “neutralizing” antibodies (nAbs), which render an invading pathogen harmless before it gets a change to infect its host. Before B cells can start producing nAbs they have to team up with so-called follicular helper T cells (TFH cells) in germinal centers, which are located in peripheral lymph nodes. There B cells undergo a tightly orchestrated, multi-step education and maturation process, which selectively promotes the proliferation of B cells that produce high-affinity antibodies and weeds out those that produce less potent ones. It has been speculated that germinal centers are very important for HIV neutralizing antibody responses. 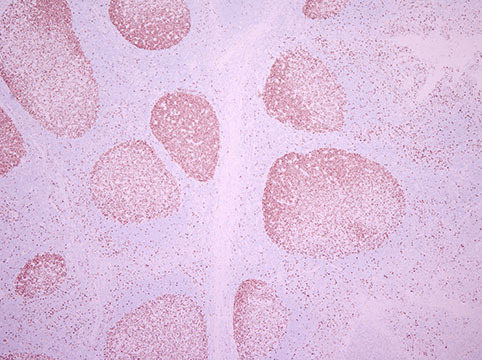 Trying to find a way to directly track the characteristics of a successful nAb response within germinal centers, Colin Havenar-Daughton, Ph.D., the study’s first author, wondered whether lymph node fine needle aspirates (LN FNAs), which have long be used by oncologists to detect the presence of metastases, could provide critical information. He teamed up with experts at the Yerkes National Primate Research Center to follow a cohort of 12 rhesus monkeys that had been immunized with a novel HIV envelope protein trimer known as SOSIP.v5.2, which closely mimics the virus’ surface. That protein was developed by collaborators at Cornell and the University of Amsterdam. “These envelope proteins have just recently become available for immunizations and most likely will go into phase I human trials soon,” explain Havenar-Daughton. Havenar-Daughton thinks he may have found a way. “We could confirm that LN FNAs provide a valuable and informative window into germinal centers to explore the difference between immune responses that result in HIV neutralizing antibodies and those that didn’t,” he says. Adds Guido Silvestri, M.D., Chief of the Division of Microbiology & Immunology at the Yerkes National Primate Research Center, whose team performed the LN FNAs: “We are very excited about the validation of a very informative yet non-invasive sampling technology such as the fine needle aspiration of lymph nodes for pre-clinical studies of novel candidate AIDS vaccines”. Neutralizing antibodies correlated directly with the frequency and quality of B and TFH cells but not with peripheral antibody titers, a standard tool to assess a vaccine’s effectiveness. “You definitely need those germinal centers and they have to work well to generate highly evolved, high affinity antibodies that can neutralize the virus,” says Havenar-Daughton. Going forward, this work has demonstrated the value of an important new tool in vaccine trials for providing a window into what it will really take to make a successful HIV vaccine, and vaccines against other difficult infectious diseases. This work was supported by the Scripps CHAVI-ID , the National Primate Research Funding (P51 RR000165/OD011132, the National Institute of Allergy and Infectious Diseases (P30-AI504), the Gates Foundation and the European Research Council (ERC-StG-2011-280829-SHEV). “Direct probing of germinal center responses reveals immunological features and bottlenecks for neutralizing antibody responses to HIV env trimer.” Colin Havenar-Daughton, Diane G. Carnathan, Alba Torrents de la Peña, Matthias Pauthner, Bryan Briney, Samantha M. Reiss, Jennifer S. Wood, Kirti Kaushik, Marit J. van Gils, Sandy Rosales, Patricia van der Woude, Michela Locci, Khoa M. Le, Steven W. de Taeye, Devng Sok, Ata Ur Rasheed Mohammed, Jessica Huang, Sanjeev Gumber, Anapatricia Garcia, Sudhir P. Kasturi, Bali Pulendran, John P. Moore, Rafi Ahmed, Gregory Seumois, Dennis R. Burton, Rogier W. Sanders, Guido Silvestri, Shane Crotty. Cell Reports, 2015.